The weather is cooling down, the Christmas carols are softly playing, the stores are overflowing with shoppers, and we who are believers have the wonderful opportunity of celebrating the Christ of Christmas. Because He is alive, we can experience peace, joy and fulfillment and impact our world with the glorious gospel. And the month of December provides many opportunities to do just that. 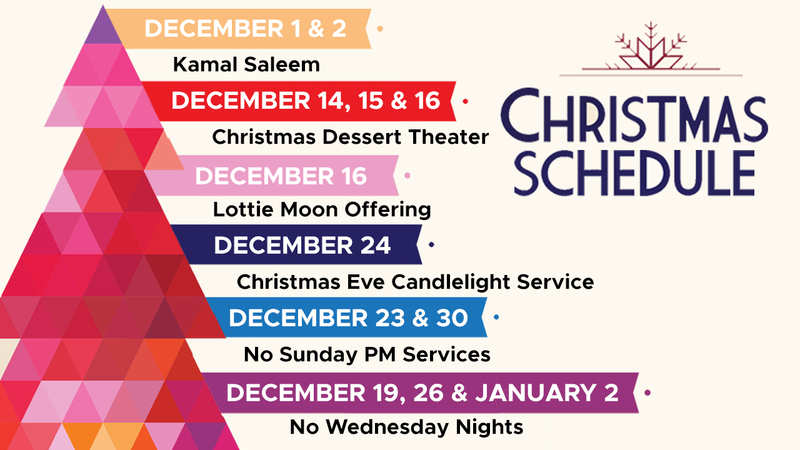 Kamal Saleem will be with us on Saturday evening at 6:30pm, Dec. 1 and in all of our services Sunday, Dec. 2. Kamal Saleem was born to a Muslim family in the heart of the Middle East. He was recruited by the Muslim Brotherhood at an early age and completed his first mission in Israel at the age of seven. He was also recruited by the PLO and other radical Muslim groups. Kamal is uniquely equipped with tremendous insight into today's world situation. He has a wealth of knowledge concerning the true culture and agenda of radical Islam. He is well versed in the Bible, Koran, Hadith and Sira (Shariah Law). He believes radical Islam is the most broadly disguised present danger to Christians, Jews and all non-Muslim people of the world. Kamal carries a message from God to awaken and equip the Church. This important weekend is not just for some members, but all members of LCC. Please invite your friends, and make every effort to join us. You’ll be informed, inspired and equipped to better understand the complexity of our ever changing culture. If you have a daughter between the ages of 3 and 12 please plan to attend our Daddy Daughter night on Saturday, Dec. 8 from 7:00pm to 8:30pm. It will be a special evening and an opportunity to make memories that you and your daughter will never forget. Our Sing Joy Christmas Dessert Theater will be presented on Friday, Dec. 14 – Sunday Dec. 16 at 7:00 pm each night. Bring your family and friends as we enjoy uplifting music, drama, coffee and dessert as we celebrate the joy of Christmas. Tickets are $3 each and must be purchased in advance. You can pick those up in the lobby after church services or during the week during office hours. For ticket information, contact Ellie Strenk. She has the seating chart and tickets. On Sunday, Dec 16, we will be giving our gift to the Lord Jesus through the Lottie Moon Christmas offering. Every dollar given will go directly to the mission field to support missionaries all over the world who want be home for Christmas. Our goal for this year is $60,000. Pastor Dean will be leading our Christmas Eve candlelight service on Dec 24 at 5:00pm. There will be no Sunday evening services on the 23rd and 30th, and no Wednesday evening services on the 19th and 26th. As we prepare to conclude this year and celebrate the Christmas season, I want to encourage you to make memories that you will always cherish. Make memories with your family and with your church family that will honor our Lord, build His Kingdom and bless your life. The most memorable Christmas ever awaits each of us if we will step out by faith and allow the Christ of Christmas to live in and through us. Joy to the World, the Lord has come! May you and your family have a Merry Christmas and a Happy New Year!